2016/17 Ukrainian League. 27th round. April 30, 2017. Kharkiv. OSC Metalist. Att: 6,114. 22oC. The Donetsk outfit met with the league’s fourth team. In the previous round, Shakhtar and Oleksandriia claimed wins with the same 1-0 score: the Pitmen proved stronger than Dynamo, while the citizens won the game vs Olimpik. After personnel changes in the cup tie against Dnipro (1-0), Paulo Fonseca fielded against the Oleksandriians the same line-up as in the league match against the Kyiv side. The opening minutes could well become effective. First, Facundo Ferreyra had a chance to excel. After a corner delivery by Darijo Srna, the Brazilian forward won an aerial challenge, but failed to find the back of the net with his header. A bit later, Oleksandriia had a chance – the ball hit the crossbar following the strike by Yevhen Banada. Later, the events developed similarly: Shakhtar attacked positionally most of the time, with the visitors parking the bus and trying to carry out some blistering counter-attacks. The away side’s Brazilians were active, they regularly created danger near the opposing goal through their individual brilliance. But Taison, Marlos and Bernard often lacked the killer pass or the accurate finisher. Towards the half end, Volodymyr Sharan's lads also reminded of themselves: Artem Polyarus twoce found himself spearheading attacks, with the ball hitting the woodwork on the first occasion, and Andriy Pyatov showing off excellent reflexes on the second one. After the break, the Pitmen’s advantage became overwhelming, with the play taking place only in one half of the field. Shakhtar players controlled the ball for long. The Donetsk team actively connected the wings, with crosses and set pieces being dangerous. In the 64th minute, Facundo Ferreyra headed Darijo Srna’s pass, but the Oleksandriia keeper showed excellent reflexes by pulling the ball from the bottom corner. Shortly afterwards, the captain himself checked Andrii Novak’s reflexes, with the away keeper coping with the shot again. In the 63rd minute, Dentinho came on for Bernard. The number nine got off to an active start, lacking just few inches to beat the rushing goalkeeper. A bit later, Paulo Fonseca fielded Gustavo Blanco Leschuk, who replaced Viktor Kovalenko, with the Orange-and-Blacks switching to the formation with two forwards. Pressure on the Oleksandriia goal intensified, and in the 81st minute Shakhtar did it. Another high cross by Darijo Srna embodied in the goal by Facundo Ferreyra, who once again proved his heading ability – 1-0. The Argentine scored goals in three consecutive games, increasing the gap from competitors in the goal-scoring race. 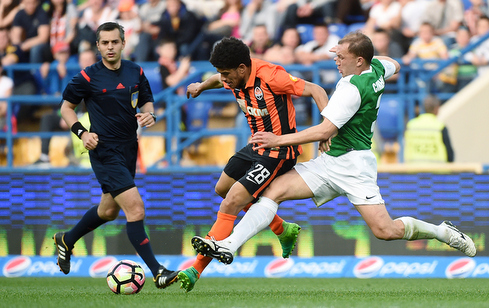 Taison could have distinguished himself in the closing stages, but his one-on-one against Andrii Novak was won by the goalkeeper. As a result, Shakhtar claimed a narrow win over Oleksandriia and got one step closer to the title glory. The Pitmen’s next match will be held on May 6. Within the 28th round of the Premier League, the Orange-and-Blacks will meet with Zorya in Kharkiv. The game kicks off at 17:00.